Here’s the recipe so you can all try cooking them at home! Soak ribs for 1+ hrs in cold water to take the blood out of the bones. Change the water 2-3 times during the soaking process. 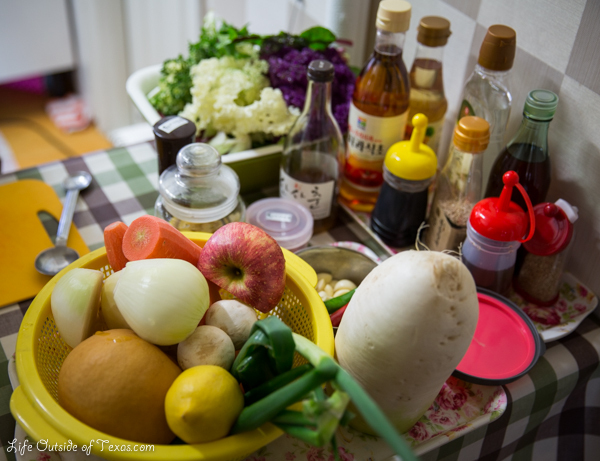 While waiting for the water to boil, prepare the marinade. Once the water boils, add 3 scoops of the boiling water to blender with the marinade ingredients and blend until smooth. Continue boiling the water and add the ribs. Boil uncovered for 5-10 minutes. Rinse the ribs, then add the marinade and let them marinate in the fridge for at least 2-3 hours or overnight. After marinating, line a large pot with thickly sliced radishes. Then, add the ribs and marinade to the pot and cook covered over high heat. If your pot isn’t large enough, you can use two pots. Once the marinade starts boiling, turn the heat down to medium and continue to cook for about 40 minutes. Next, add two potatoes and a large carrot (peeled and sliced) and cook for 10 minutes. Then, add a white onion and cook for another 10 minutes. 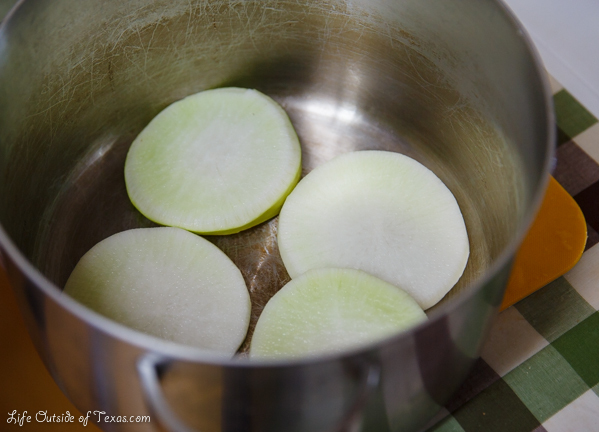 TIP 1: ROUND THE EDGES OF THE RADISH AND POTATOES SO THEY DON’T FALL APART WHILE COOKING. TIP 2: TO GIVE THESE RIBS A LITTLE EXTRA KICK, ADD A BIT OF KOREAN CHILI POWDER (고추가루) AT THE VERY END OF THE COOKING PROCESS. MIX WELL. Add sesame oil & seeds, green onions, mushrooms and diced chili peppers (optional) as a garnish and it’s done. Enjoy! If you liked this post, please LIKE Life Outside of Texas on Facebook! 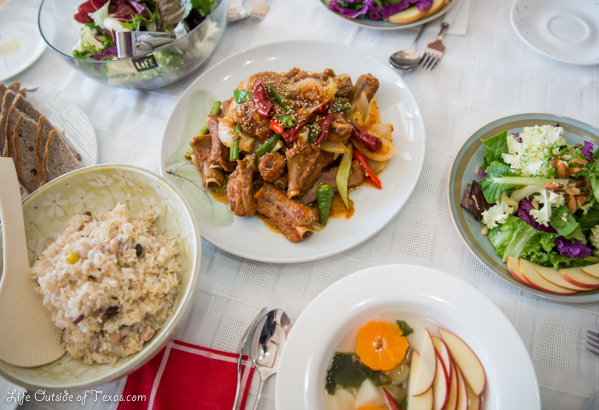 For more information on Korean cooking classes in Ulsan, click here. 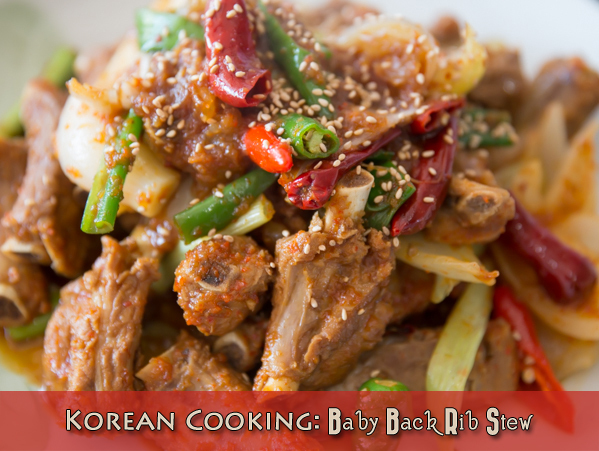 This entry was posted in Korean Cooking Classes, Korean Food and tagged baby back ribs recipe, cooking classes in Ulsan, food, Korean food, korean food blog, korean food recipes, korean foods, living in Ulsan, pork rib marinade, pork ribs recipe by Meagan & Dave | HappilyEverExpat.com. Bookmark the permalink. Thanks. It was soo delicious! Looks lovely. 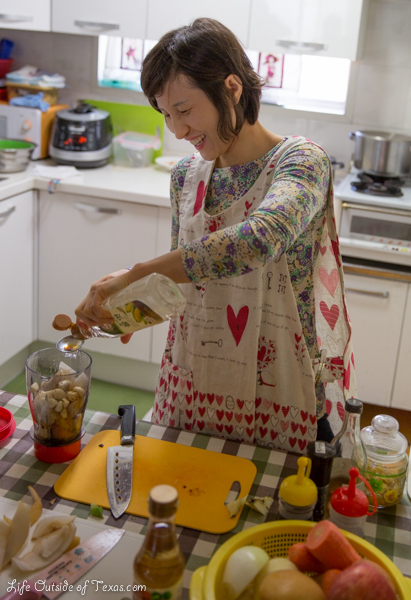 If only I were more into cooking here in Korea – I’m way too tired for cooking after 10 hours at work! When I was teaching my meals weren’t very creative. I liked this recipe because it’s something I can go back home and make for people there and I think they would really like it. This looks good!! I am also jealous of your big kitchen… I have 2 gas stoves…. and that’s about it!! That is tempting… I do mostly simple meals when I’m in Korea, and save my culinary delights when I eat out. It’s so cheap to eat out here, I don’t blame you. It’s hard to cook for one. I cook a lot more now that I’m living with my boyfriend. But never get to cook any of the recipes I learn at cooking class because my boyfriend is vegetarian. It’s so tasty. My favorite part is the radish at the bottom of the pan. They soak up all of the flavor and are super yummy. Yeah, my teacher said you can also do it with beef. It would definitely be difficult to make in a teacher’s kitchen. I don’t get to make it at home either because my boyfriend is vegetarian. oh wow! i thought i had it hard eating here with the no pork thing! 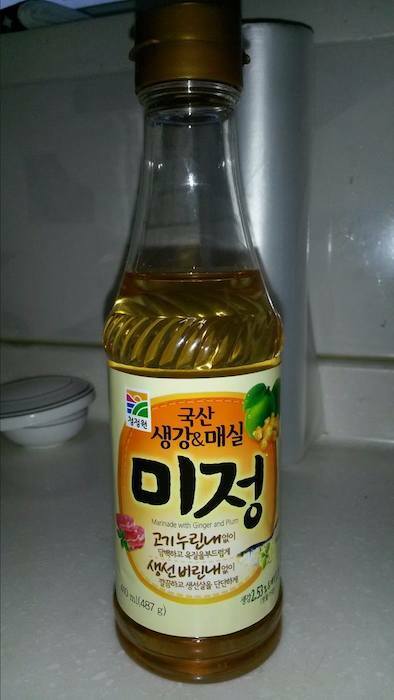 Yeah, it’s pretty tough to have dietary restrictions in Korea. We are lucky to live in Ulsan because there’s a lot of industry to there’s a huge population of foreigners working here, which means lots of foreign restaurants. The only Korean food Dave can really eat is bibimbap and pajeon! I was gonna say, can he only eat bibimbap? I would not be a camper, but thankfully you’ve got lots of options! I honestly have no idea what he ate before we started dating. I think a lot of sad bachelor meals at home… plain pasta and cheese on bread! lol But he’s picky. He won’t eat kimchi or anything pickled or fermented either. Plus, doesn’t like eggplant, sweet potato or pumpkin. It’s so amazingly delicious. I loved the ribs after the red pepper powder was added. Perfection!